Congratulations to Juemin Yang, the recipient of this year's June B. Culley Award, which honors outstanding achievement by a Biostatistics student on his or her school-wide examination paper. Juemin’s paper was entitled "Homotopic Group ICA for Multi-Subject Brain Imaging Data." Her advisor is Brian Caffo. Congratulations also to Yingying Wei (Advisor: Hongkai Ji), this year's recipient of the Margaret Merrell Award, established in 1995 by the friends, colleagues, and former students of the late faculty member Dr. Margaret Merrell (ScD, 1930). This award recognizes outstanding research by a Biostatistics doctoral student. In the November issue of Amstat News, Brian Caffo, Jeff Leek, and Roger Peng discuss their own experiences teaching via MOOCs as well as their thoughts about the future of statistical education in light of increasing demand for online statistics courses. Congratulations to our staff on their numerous accomplishments! Three staff members have been promoted in recent months: Anna Dent (to Budget Analyst); Ashley Gilliam (to Senior Administrative Coordinator); and Debra Moffitt (to Senior Administrative Manager). Additionally, our staff as a whole earned a perfect rating of 100% for both the last quarter of FY13 and first quarter of FY14 on the most recent Sponsored Composite Report Card for our School, adding to an already-impressive rating of 96% aggregated over the past year. We appreciate all you do to make us the best we can be! The September 21-27 issue of the Lancet features an article by Bloomberg School of Public Health researchers including Gayane Yenokyan, "Patterns in coverage of maternal, newborn, and child health interventions: projections of neonatal and under-5 mortality to 2035." In the paper, Gayane and her co-authors estimated historical trends in various well-proven interventions’ "coverage"—the proportion of individuals needing the intervention who actually receive it, and used their estimates to project rates of child and neonatal mortality in 2035 in 74 countries. They concluded that feasible improvements in intervention coverage can achieve substantial reductions in child mortality. Congratulations to Gayane, first author Neff Walker, and their colleagues in the work! Through a series of articles in recent issues of Amstat News, the American Statistical Association has been attempting to increase interest among statistics students and faculty in NSF and NIH pre-doctoral and postdoctoral fellowships. A companion piece profiled PhD candidate Amanda Mejia, along with several other NSF fellowship recipients. The journal Biometrics recently featured work by PhD graduate Simina Boca on a new decision-theory approach to the analysis of gene sets. The paper addresses a key problem in high-dimensional significance analysis: to find pre-defined sets that show enrichment for a statistical signal of interest such as occurs when genes are differentially expressed. Its results provide an elegant framework for analysis that addresses the key issues of overlapping annotations and difficulty in interpreting p values in both competitive and self-contained tests. Congratulations for this nice contribution to Simina and co-authors Hector Corrada Bravo (former postdoctoral fellow), Brian Caffo and Jeff Leek (current faculty members), and Giovanni Parmigiani (former faculty member)! We are very pleased to announce that Hongkai Ji has been promoted to associate professor. Our department celebrates the high scientific quality and importance of his work, the broad dissemination of his work in leading journals (along with the impact of his work through widely-used software), his exceptional clarity and skill as a lecturer, and his dedication as a mentor and departmental citizen. Congratulations, Hongkai! You make our whole department better. We are enormously proud of you. Congratulations to Rick Thompson and his colleagues on their recent receipt of a NIH grant to serve as the Data Coordinating Center for the MISTIE III stroke trial. MISTIE III is 5-year, international, multi-center phase III clinical trial that will investigate a novel minimally invasive neurosurgical technique for the treatment of intracerebral hemorrhage (ICH). There are currently no proven therapies for ICH, a condition with a one-year mortality rate greater than 40%. In addition, long-term functional impairment for ICH is substantially greater than with ischemic stroke, resulting in disastrous personal, social and economic consequences that impact approximately 100,000 Americans each year. The primary hypothesis of this trial is that rapid reduction of ICH blood clot volume within the first 3 to 4 days post-onset via minimally invasive surgery will result in better functional outcomes in recovering patients when compared to ICH clot resolution through standard of care medical management. Congratulations also to Rick’s Clinical and Biostatistics collaborators on the project: Daniel Hanley, Professor of Neurology and the Principal Investigator of the Clinical Coordinating Center for MISTIE III, Michael Rosenblum, Gayane Yenokyan, Marie Diener-West, Carol Thompson, Andre Hackman, and Josh Betz. Congratulations to Leah Jager and Jeff Leek, whose paper "An estimate of the science-wise false discovery rate and application to the top medical literature," has just appeared via advance access in Biostatistics with discussion from an eminent panel including Yoav Benjamini, Andrew Gelman, Steve Goodman, and D. R. Cox. Jeff has posted a superb summary making the paper and all the discussions easily accessible on Simply Statistics. The compendium comprises a read that is both thought-provoking and entertaining. We are extremely proud of this work and the outstanding scientific discourse it has generated. Postdoctoral fellow Brooke Anderson has been awarded a K99-R00 grant from the NIH to investigate the health effects of climate related disasters in the United States. Her research will develop models to investigate effects of cyclonic storms such as hurricanes, tropical storms, and tropical depressions on all-cause morbidity and mortality, and then apply these methods to investigate the effects of cyclonic storms on human health in the United States. Brooke’s grant will support her in completing another 1-2 years of training here with us, and then her initial period as an assistant professor in her first faculty position. Brooke also has just been named as a runner-up for the 2013 Rothman Prize for her paper "Lights Out: Impact of the August 2003 Power Outage on Mortality in New York, NY," co-authored with Michelle Bell. The Rothman Prize is awarded each year for the best paper in the journal Epidemiology. Congratulations, Brooke! Congratulations too to her advisor, Roger Peng. Congratulations to Assistant Professor Jeff Leek, whose online data analysis course was featured in a recent Quartz article on the 10 Coursera courses with the highest enrollment. Congratulations to Dan Scharfstein & colleagues for being awarded a PCORI Methodology research grant, "Sensitivity Analysis Tools for Clinical Trials with Missing Data." This project aims to address the problem of missing outcome data in clinical trials by: (a) creating unified and coherent methods for global sensitivity analysis of clinical trials with monotone and non-monotone missing data; (b) developing free, open source and reproducible software in SAS and R to implement the methods; (c) demonstrating the methods and software using clinical trial data with patient-centered outcomes; and (d) disseminating the methods and software. The tools to be created will innovatively augment those available to clinical researchers to combat this important problem. 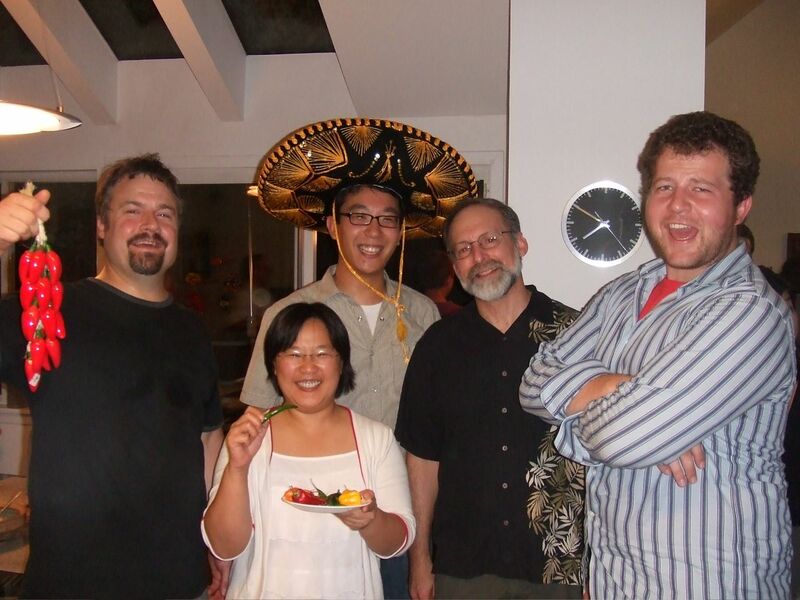 Dan's co-investigators in the work to be done are Liz Stuart, Aidan McDermott, and Tianjing Li. Congratulations to PhD candidate Therri Usher, who has been accepted into the inaugural cohort of the Johns Hopkins Preparing Future Faculty Teaching Academy. Program participants will acquire an overview of pedagogy, explore different educational models, acquire teaching and assessment skills, and work with faculty teaching mentors in a classroom, online course, or laboratory environment. An optional component at the end of the program will offer the opportunity for participants who wish to explore the possibility of contributing to the scholarship of teaching and learning to develop teaching-as-research projects as part of their hands- on teaching experience. We are very pleased to announce that Ciprian Crainiceanu has been promoted to Professor. Ciprian’s accomplishments were outstandingly lauded by those who wrote letters to review his academic record, a panel truly notable as luminaries in our field. Among many impacts of the prolific body of work Ciprian has led, his scholarship is making it possible to conduct rigorous analyses of data acquired through imaging, wearable computing, and other data-intensive measurement modalities with sufficient computational efficiency that the methods can be feasibly applied in epidemiological cohort studies -- a true breakthrough for leveraging these data to improve the public health. Moreover he has contributed to discovery regarding a host of specific health problems, from mapping brain function in older adults with Alzheimer’s disease, to delineating neural changes and brain lesion processes accompanying multiple sclerosis, to characterizing sleep quality and determining its effects on health outcomes, to understanding patterns of activity in older adults using accelerometers, to quantifying measurement error in observational studies. Finally he is an exceptionally energetic and effective teacher and mentor and a valued colleague. Ciprian makes us better in so many tangible and intangible ways. Congratulations, Ciprian! Faculty members Brian Caffo, Ciprian Crainiceanu, and Martin Lindquist have written a nice editorial for the Huffington Post on the need for statisticians in neuroimaging. The July 22 issue of the New York Times highlights recent work by O. Joseph Bienvenu et al, with statistical contributions from Biostatistics PhD candidate Jonathan Gellar, ScM alumnus Ben Althouse, and Assistant Scientist Elizabeth Colantuoni. It is estimated that 35% of patients surviving ICU stays for critical illness present with PTSD symptoms within the first two years after the ICU stay. The NYT article provides several disturbing personal accounts of PTSD symptoms along with highlighting the need for physical AND mental health evaluations in ICU survivors. Congratulations to PhD candidate Jonathan Gellar, who won the best student paper award at the Statistical Modeling Society's 28th International Workshop on Statistical Modeling (IWSM). Our department was also represented by ScM graduate and incoming PhD candidate Elizabeth Sweeney and PhD candidate Jiawei Bai, both of whom gave excellent presentations and made a huge impression on the organizers. The IWSM is one of Europe's most important statistics conferences and was attended by more than 200 researchers from the USA, Germany, Italy, Spain, Belgium, Netherlands, Portugal, France, Ireland, Brazil, Chile, and the UK. Congratulations to Assistant Professor Jeff Leek, who has been awarded an NIH R01 grant to develop methods for characterizing and addressing biological and technical variation in RNA sequencing (RNA-seq) data, and software by which to implement them. RNA seq has become the method of choice for making measurements of gene expression. However statistical methods are needed to ensure the interpretability of these data. Dr. Leek’s proposal will tackle three key challenges: to estimate and remove hidden artifacts in the data, to create methods that can account for differential expression but do not require annotation or genome assembly, and to develop methods to correct ambiguous, variable and unidentifiable assemblies. Dr. Leek’s work will create a modular, integrated pipeline which promises to increase researchers’ capacity to exploit RNA seq data to discover the molecular architecture of diseases and develop prognostic signatures through which at-risk patients can be identified and treated. Assistant Scientist Gayane Yenkoyan, in collaboration with lead author Mark Riddle and others, has been selected to receive the American Academy of Child and Adolescent Psychiatry's Elaine Schlosser Lewis Award for best paper on ADHD appearing in the Journal of the American Academy of Child and Adolescent Psychiatry over the past year. Their paper, entitled "The Preschool Attention-Deficit/Hyperactivity Disorder Treatment Study (PATS) 6-Year Follow-Up," appeared in the March issue of the JAACAP. The award is scheduled to be presented at the AACAP's annual meeting in October. Congratulations, Gayane and colleagues! Congratulations to Jean-Philippe Fortin, the recipient of this year's award honoring outstanding performance by a PhD student on the Biostatistics first-year comprehensive exam. Congratulations also to Yao Lu and Shilu Zhang, co-recipients of the Kocherlakota Award, which honors outstanding performance by a master’s student on the Biostatistics first-year comprehensive exam. Jean-Philippe, Yao, and Shilu will be presented with their awards at an upcoming ceremony in the fall -- date to be announced. Congratulations to PhD candidate Fang Han, who was recently awarded a 2013 Global Google PhD Fellowship (one of only 15 students from the US and Canada). The program recognizes and supports outstanding graduate students from around the world who are pursuing work in computer science, related disciplines or promising research areas. Congratulations to Associate Professor Martin Lindquist, who has been awarded an NIH R01 grant to develop a basic framework for causal inference in functional magnetic resonance imaging (fMRI) research. Researchers use techniques such as fMRI to study effects of external stimuli on human brain function and causal relations among different brain regions. The concern with causal issues has prompted much work; however, in this work associations frequently have been interpreted as effects, often inappropriately. This is a major problem for a ﬁeld where causation occupies center stage. In addition to the development of a rigorous causal framework fMRI research, Dr. Lindquist's work will also extend the statistical literature on mediation, leading to a body of methods for causal inference with high dimensional data. Congratulations to Marie Diener-West, who has been named by the Student Assembly for the 2013 Golden Apple Award for teaching excellence, large class size. The Golden Apple is the highest teaching recognition of our School, reserved to individuals in four class size / type categories per year. This is Marie’s 7th (!) instance of receiving the award. The department is grateful to Marie for the excellence she brings to the department. For all of us who work with her, it is truly our privilege. Way to go, Marie! In work recently appearing in the Proceedings of the National Academy of Sciences, Assistant Professor Hongkai Ji, with PhD graduate Yang Ning and others, addresses an emerging problem in functional genomics -- how multiple types of high-throughput genomic data can be analyzed jointly to reveal differences between cell types, disease states, or other biological conditions. His methodology provides a unique solution to this problem by integrating unsupervised pattern discovery, dimension reduction and statistical tests into a single framework. The authors illustrate the broad utility of their work by predicting how transcription factors differentially regulate their target genes. The journal Biometrics recently featured work by Associate Professor Ciprian Crainiceanu, with PhD graduate Jeff Goldsmith and former postdoctoral fellow Sonja Greven, on a method for obtaining correct curve estimates by accounting for uncertainty in functional principal components (FPC) decompositions. The New England Journal of Medicine recently published work by Associate Professor Martin Lindquist, with co-authors, on possible uses of functional magnetic resonance imaging (fMRI) in pain assessment. Assistant Scientist Elizabeth Colantuoni and Research Associate Amy Wozniak were part of the research team whose work on the follow-up evaluation of an NHLBI study on acute lung injury appeared in a recent issue of the journal BMJ. PhD candidate Fang Han will receive the International Chinese Statistical Association (ICSA)'s Student Paper Award at the ICSA/International Society for Biopharmaceutical Statistics (ISBS) 2013 Joint Conference, to be held in June. Fang's winning paper is entitled "Optimal Sparse PCA in High Dimensional Elliptical Model" and was written in collaboration with our adjunct faculty member Han Liu. We congratulate all these colleagues on their notable contributions to scholarship this spring! The Huffington Post recently featured an article by faculty member Tom Louis, with colleage Rod Little, on the work of the Census Bureau. Besides being a Professor of Biostatistics, Tom also serves as Associate Director for Research and Methodology as well as Chief Scientist at the Census Bureau. Congratulations to postdoctoral fellow Guy Mahiane, who was awarded the French Statistical Society's Prix du Docteur Norbert Marx for his 2010 article "Mathematical models for coinfection by two sexually transmitted agents: the human immunodeficiency virus and herpes simplex virus type 2 case" (Journal of the Royal Statistical Society - Series C Applied Statistics). The Departments of Biostatistics and Epidemiology are pleased to announce that the winning proposals for this year's Louis I. and Thomas D. Dublin Award are from Jenna Krall from the Department of Biostatistics and from Andrew Azman from the Department of Epidemiology. While there were many strong applications, the award committee chose their proposals (“Estimating Health Effects of Particulate Matter Sources Using Factor Analysis When Data Are Censored Below the Detection Limit,” and “Heterogeneity in Cholera Transmission and Its Implications for Reactive Vaccination,” respectively) as best exemplifying the award's goal of fostering research and education at the interface of biostatistics and epidemiology. Congratulations to Assistant Professor Jeff Leek and jointly-appointed faculty member Steven Salzberg, whose commentary on sequestration has appeared in a recent issue of Genome Biology. Fang Han has won a 2013 AISTATS Notable Paper Award for work he submitted together with Adjunct Faculty member Han Liu and Zhaoran Wang. AISTATS is one of the leading conferences on Machine Learning in Computer Science. At the conference, to occur later this year, Fang will provide an oral presentation of his winning paper "Sparse Principal Component Analysis for High Dimensional Multivariate Time Series." Among 211 paper submissions, only 24 were selected for oral presentation, and just 6 were selected as "Notable Papers." We congratulate Fang and his co-authors on their excellent work! Congratulations to Steven Salzberg, who has been named the recipient of the 2013 Benjamin Franklin Award for Promoting Open Access in the Life Sciences. In the award citation, Dr. Salzberg was lauded for his many contributions to open access bioinformatics software, spanning packages for bacterial gene finding, whole-genome alignment, next-generation sequencing analysis, and genome assembly. The citation also noted Dr. Salzberg’s public advocacy for greater sharing of data and against software and gene patents. More information may be found here. Dr. Salzberg is a jointly-appointed professor in the department as well as Professor of Medicine. Congratulations to this year's recipients of the Helen Abbey Award for Excellence in Teaching: Kirsten Lum, Therri Usher, and George Wu. Congratulations to Postdoctoral Fellow Sherri Rose, whose article "Mortality risk score prediction in an elderly population using machine learning” has been selected as the Editor's Choice in the current issue of the American Journal of Epidemiology (AJE). In the article, SuperLearner--an ensemble approach that produces a prediction function from among multiple candidates--was found to outperform other algorithms for predicting mortality in older adults. Congratulations to Associate Professor Ingo Ruczinski, his mentee Shelley Herbrich, and their colleagues, who have just published work challenging the standard paradigm for analyzing proteomic experiments based on isobaric labeling methods with reporter fragment ions. Such experiments typically include a common reference standard, in which protein relative abundance is estimated and combined across multiple experiments ("masterpool"). The new work shows that using such a reference standard is counterproductive - one can obtain more precise estimates of protein relative abundance by processing the available biological data instead through a random intercept model. You can check it out in the December, 2012 issue of the Journal of Proteome Research. Congratulations to Shanshan Li (Advisor: Mei-Cheng Wang; Co-Advisor: Brian Caffo), this year's recipient of the Margaret Merrell Award, established in 1995 by the friends, colleagues, and former students of the late faculty member Dr. Margaret Merrell (ScD, 1930). This award recognizes outstanding research by a Biostatistics doctoral student. Kudos to Biostatistics student Hilary Parker, whose data-informed reflections on the demise in popularity of her name have been picked up by New York Magazine. In the piece, originally posted on her blog, Hilary compares the precipitous decline in the frequency of "Hilary" as a choice of baby name occurring in 1993 to other female names most dramatically declining in popularity in the US over the last 132 years. You can check out her findings here. Congratulations, Hilary! Congratulations to Professor Constantine Frangakis, who has been awarded a four-year NIH R01 grant to develop designs and methods to accurately estimate survival in programs such a PEPFAR. Dropout poses a severe challenge for such estimation. Professor Frangakis has previously developed designs in which a subset of those dropping out are targeted and intensively pursued, termed "double sampling" designs. The current work will develop methods to estimate survival from an existing double sampling design as well as create new double-sampling designs optimizing accuracy subject to cost constraints and that best target clinical goals. Professor Frangakis will lead a team of collaborators including former student Ming An in the work. Professor Mei-Cheng Wang and student Shanshan Li have developed a new tool for evaluating the predictive accuracy of biomarkers using tree-based classification rules. Their research extends the conceptual framework, methods and properties of Receiver Operating Curve (ROC) analysis from the assessment of single markers at a time to a multivariate marker setting. The new procedures are useful for evaluating predictive accuracy based on different choices of markers as well as for evaluating different and-or combinations in classifiers. The work recently appeared in Biometrics. We are pleased to announce that Brian Caffo has been promoted to the rank of Professor. Our department celebrates Brian’s many research achievements, excellence as an educator, generous contributions to better the School, profession, and all of us, and outstanding recognition for the same. Congratulations, Brian: we're very proud of you! Congratulations to Fang Han and Yingying Wei, who have been recognized with Student Travel Awards for papers to be presented at the 2013 annual meeting of the International Biometrics Society / Eastern North American Region, as well as to their advisors, Han Liu and Brian Caffo (Fang), and Hongkai Ji (Yingying). Their winning papers were: "Principal Component Analysis on High Dimensional Non-Gaussian Dependent Data" (Fang) and "iASeq: Integrative Analysis of Allele-Specificity of Protein-DNA Interactions in Multiple ChIP-seq Datasets" (Yingying). We are pleased to announce that John McGready has been promoted to Associate Scientist. Our department celebrates the excellence of John’s teaching, research and professional practice as well his national reputation as an outstanding teacher of biostatistics. Congratulations, John, we're very proud of you! Congratulations to Associate Professor Brian Caffo, who was featured in November 14 and November 3 Washington Post articles examining the recent proliferation in academia of “massive open online courses,” or “MOOCs.” Brian’s course Mathematical Biostatistics Boot Camp has an enrollment of approximately 15,000 students. Other faculty members participating in the Hopkins Coursera initiative are Associate Professor Roger Peng (Computing for Data Analysis) and Assistant Professor Jeff Leek (Data Analysis). Thanks, Brian, Roger and Jeff, for putting us out there! Congratulations to Yingying Wei and Zhenke Wu, co-recipients of this year's June B. Culley Award, which honors outstanding achievement by a Biostatistics student on his or her school-wide examination paper. Yingying's paper was entitled "Correlation Motif Method for High-Throughput Genomics Data." Her advisor is Hongkai Ji. Zhenke's paper was entitled "Hierarchical Bayesian Model for Combining Information from Multiple Biological Samples with Measurement Errors: An Application to Children Pneumonia Etiology Study." His advisor is Scott Zeger; his co-advisor is Han Liu. The October 4 issue of the New England Journal of Medicine features a report from an expert panel commissioned by the National Research Council on the importance of preventing or accounting for missing information in clinical trials. Professors Constantine Frangakis and Daniel Scharfstein were among those serving on the panel. Click here to read an overview of the article. From statistical genetics to causal inference and aging to cancer to honeybees: A fascinating week for publishing in the department. Enjoy! Xue QL, Bandeen-Roche K, Mielenz TJ, Seplaki CL, Szanton SL, Thorpe RJ, Kalyani RR, Chaves PH, Dam TT, Ornstein K, Roychoudhury A, Varadhan R, Yao W, Fried LP: Patterns of 12-year change in physical activity levels in community-dwelling older women: can modest levels of physical activity help older women live longer? American Journal of Epidemiology 176(6):534-43, 2012. Jedynak BM, Lang A, Liu B, Katz E, Zhang Y, Wyman BT, Raunig D, Jedynak CP, Caffo B, Prince JL for the Alzheimer's Disease Neuroimaging Initiative: A computational neurodegenerative disease progression score: Method and results with the Alzheimer's disease neuroimaging initiative cohort. Neuroimage 63(3):1478-1486, 2012. Georgiades C, Geschwind JF, Harrison N, Hines-Peralta A, Liapi E, Hong K, Wu Z, Kamel I, Frangakis C: Lack of response after initial chemoembolization for hepatocellular carcinoma: does it predict failure of subsequent treatment? Radiology 265(1):115-23, 2012. Herb BR, Wolschin F, Hansen KD, Aryee MJ, Langmead B, Irizarry R, Amdam GV, Feinberg AP: Reversible switching between epigenetic states in honeybee behavioral subcastes. Nature Neuroscience 15(10):1371-3, 2012. Jorgensen TJ, Ruczinski I, Yao Shugart Y, Wheless L, Berthier Schaad Y, Kessing B, Hoffman-Bolton J, Helzlsouer KJ, Kao WH, Francis L, Alani RM, Strickland PT, Smith MW, Alberg AJ: A population-based study of hedgehog pathway gene variants in relation to the dual risk of basal cell carcinoma plus another cancer. Cancer Epidemiology 36(5):e288-93, 2012. Emond MJ, Louie T, ..., National Heart, Lung, and Blood Institute (NHLBI) GO Exome Sequencing Project (includes Ruczinski I), et al: Exome sequencing of extreme phenotypes identifies DCTN4 as a modifier of chronic Pseudomonas aeruginosa infection in cystic fibrosis. Nature Genetics 44(8):886-9, 2012. Boileau C, Guo DC, ..., National Heart, Lung, and Blood Institute (NHLBI) Go Exome Sequencing Project (includes Ruczinski I), et al: TGFB2 mutations cause familial thoracic aortic aneurysms and dissections associated with mild systemic features of Marfan syndrome. Nature Genetics 44(8):916-21, 2012. Schwender H, Taub MA, Beaty TH, Marazita ML, Ruczinski I: Rapid testing of SNPs and gene-environment interactions in case-parent trio data based on exact analytic parameter estimation. Biometrics 68(3):766-73, 2012. Kalyani RR, Tian J, Xue QL, Walston J, Cappola AR, Fried LP, Brancati FL, Blaum CS: Hyperglycemia and incidence of frailty and lower extremity mobility limitations in older women. Journal of the American Geriatrics Society 60(9):1701-7, 2012. Faussone-Pellegrini MS, Grover M, Pasricha PJ, Bernard CE, Lurken MS, Smyrk TC, Parkman HP, Abell TL, Snape WJ, Hasler WL, Unalp-Arida A, Nguyen L, Koch KL, Calles J, Lee L, Tonascia J, Hamilton FA, Farrugia G, NIDDK Gastroparesis Clinical Research Consortium (GpCRC): Ultrastructural differences between diabetic and idiopathic gastroparesis. Journal of Cellular & Molecular Medicine 16(7):1573-81, 2012. Cheng YJ, Wang MC: Estimating propensity scores and causal survival functions using prevalent survival data. Biometrics 68(3):707-16, 2012. We are pleased to announce that, as part of our School's formal partnership with Coursera, faculty members Brian Caffo, Jeff Leek, and Roger Peng are teaching three of eight courses within the inaugural Johns Hopkins provision of massive open online courses (MOOCS). The Biostatistics courses are: Mathematical Biostatistics Bootcamp (Caffo); Data Analysis (Leek); and Computing for Data Analysis (Peng). Congratulations to Lei Huang, who is the recipient of this year's award honoring outstanding performance by a PhD student on the Biostatistics first-year comprehensive exam. Congratulations also to Bing He, who is the recipient of the Kocherlakota Award, which honors outstanding performance by a master’s student on the Biostatistics first-year comprehensive exam. Both Lei and Bing will be presented with their awards at an upcoming ceremony in the fall -- date to be announced. Congratulations to Marie Diener-West, who was recently inducted as a Fellow of the Society for Clinical Trials (SCT). Marie was recognized for her "leadership in the design and conduct of clinical trials, for broad educational activities on major topics relating to clinical trials, and for substantial service to the Society." Click here to read the complete SCT citation. The Department of Biostatistics at Harvard School of Public Health has named Professor Rafael Irizarry the 2012 Myrto Lefkopoulou Distinguished Lecturer. Each year the Lectureship is awarded to a promising statistician who has made contributions to either collaborative or methodologic research in the applications of statistical methods to biology or medicine and/or has shown excellence in the teaching of biostatistics. Ordinarily, the lectureship is given to a statistician within 15 years of receiving an earned doctorate. This year’s lecture is scheduled for September 13 at Harvard. Congratulations, Rafa! Postdoctoral fellow Sherri Rose (advisor: Michael Rosenblum) is the recipient of a Delta Omega Scholarship for her research proposal "When to Initiate Combined Antiretroviral Therapy in HIV-Infected Persons in the United States." 2011-12 graduate Russell Shinohara has been inducated into the Alpha Chapter of the Delta Omega Public Health Honor Society. The "Statistical Ninjas," the Biostatistics-based soccer team in the JHMI competition, has won the intramural soccer tournament. This was a hard-won tournament where students and faculty have worked hard and passionately to win. In the finals the Ninjas "conquered" PubMed with a score of 2-0 and a phenomenal defense. Everyone played magnificently in a team that got better with every game. A photo of the victors appears here. Congratulations, Ninjas! You do us proud yet again! Congratulations to John McGready on receiving a 2011-12 Golden Apple Award, given by the Student Assembly of the Johns Hopkins Bloomberg School of Public Health in recognition of teaching excellence. The Golden Apple is the highest teaching recognition of our School, reserved to a very few individuals per year. In this year’s announcement only two faculty members were named. John is receiving the award for the fourth time: every time he has been eligible. He is carrying on a tradition of excellence in teaching that dates back to the department’s founding. In addition to his many SPH accolades, John was the winner of the Association of Schools of Public Health (ASPH)/Pfizer Early Career in Public Health Teaching Award and the Outstanding Teaching Award given by the American Statistical Association’s Section on Teaching Statistics in the Health Sciences in 2010. Congratulations, John! Congratulations to recent PhD graduate Jennifer Feder Bobb (advisor: Roger Peng), the recipient of the 2012 John M. Chambers Statistical Software Award together with Ravi Varadhan. Jennifer and Ravi have developed a software suite in R comprising cutting-edge acceleration schemes for speeding up the EM algorithm. Ravi is an alumnus and jointly-appointed faculty member of our department. Jennifer and Ravi are the first Hopkins-affiliated recipients of the John M. Chambers Award. Together with Professor Marie Davidian of North Carolina State University, Professor Tom Louis co-authored a solicited editorial with accompanying podcast for the April 6 issue of Science magazine. In their editorial, “Why Statistics,” Davidian and Louis highlight the need for a substantially increased number of statisticians if the growing demand for expertise in data science is to be met as well as key roles for statistics in propelling science and informing policy development. We are proud to have had a part, through Professor Louis, in making visible the importance of our field. Professor Louis is the retiring Chair of the AAAS Statistics Section, and Professor Davidian is the President-elect of the American Statistical Association. Congratulations to research associate Ben Langmead, who was profiled in the April issue of Nature Methods. The Departments of Biostatistics and Epidemiology are pleased to announce that the winning proposals for this year's Louis I. and Thomas D. Dublin Award are from Kirsten Lum from the Department of Biostatistics and from Henrik Salje from the Department of Epidemiology. While there were many strong applications, the award committee chose their proposed research (in the area of environment and reproduction, and on the role for phylogeography in understanding the micro-scale dispersal dynamics of Dengue virus in Bangkok, respectively) as best exemplifying the award's goal of fostering research and education at the interface of biostatistics and epidemiology. Congratulations to Kirsten and Henrik! Congratulations to this year's recipients of the Helen Abbey Award for Excellence in Teaching: Alyssa Frazee and Hilary Parker. Professor Tom Louis, in collaboration with lead author Lawrence Appel and others, has been recognized for a paper selected by the Society of General Internal Medicine Best Published Research Paper of 2011. Their paper, "Comparative Effectiveness of Weight-Loss Interventions in Clinical Practice," reported on two behavioral interventions, one delivered with in-person support and the other delivered remotely. Their study found that obese patients achieved and sustained clinically significant weight loss over a period of 24 months in both intervention groups. It appeared in the November 30, 2011 issue of the New England Journal of Medicine. The award will be announced to the society membership on Friday, May 11 at the Awards Ceremony at the SGIM Annual Meeting in Orlando, Florida. Congratulations to Tom, Larry, and their colleagues! Six Biostatistics faculty members have been named as second-term 2011-12 JHSPH Outstanding Teachers: Associate Professor Ciprian Crainiceanu for Advanced Methods in Biostatistics VI; Assistant Professor Hongkai Ji for Advanced Statistical Computing; Assistant Scientist John McGready for Statistical Reasoning in Public Health II; Assistant Professor Michael Rosenblum for Essentials of Probability and Statistical Inference II; Professor Daniel Scharfstein for Advanced Statistical Theory II; and joint faculty member Sarah Wheelan for Analysis of Biological Sequences. Recognition of exceptional teaching is given for instructors who earn outstanding ratings for the categories of "Overall Course" and "Overall Instructor." Additionally, four other faculty members were "unofficially" recognized for teaching excellence (ie, their course's participation rate was just under the 70% required by the School): Associate Professor Brian Caffo, for Advanced Methods in Biostatistics II; Research Associate Andre Hackman, for Introduction to Data Management; joint faculty member Fernando Pineda, with co-instructor Michael Ochs, for Biological Databases and Distributed Computing; and Professor Mei-Cheng Wang for Survival Analysis II. Congratulations to Andrew Jaffe, whose poster "Bump Hunting in Genomics Data from Large Epidemiological Studies" garnered 3rd place in the Basic/Lab Science category of the School's Delta Omega Poster competition. Congratulations also to Yingying Wei, who won the 2012 Biostatistics Poster Competition, a subset of the Delta Omega competition. Her poster was entitled "iASeq: Integrating Multiple ChIP-seq Datasets for Detecting Allele-specific Binding." Congratulations to Biostatistics student Yang Ning, whose work has been recognized with the 2012 David Byar Young Investigator Award sponsored by the ASA Biometrics Section. The Byar Award recognizes a meritorious paper to be presented at the upcoming Joint Statistical Meetings by an investigator holding a doctorate in statistics, biostatistics or a related quantitative field for three years or less as of April 1 of the current year, or who is currently in active pursuit of a doctoral degree in statistics or biostatistics. Yang's winning paper is "Reducing the Sensitivity to Nuisance Parameters in Nonstandard Likelihood," co-authored with Kung-Yee Liang. In addition to the Byar Award, the Biometrics Section is recognizing eight outstanding papers in the Byar competition for travel awards. Two of the winning authors are from the Hopkins Biostatistics community: student Jeff Goldsmith (with co-authors Sonja Greven and Ciprian Crainiceanu) for the paper "Corrected Confidence Bands for Functional Data Using Principal Components," and Assistant Professor Han Liu (with co-authors Fang Han, Ming Yuan, John Lafferty, and Larry Wasserman) for the paper "The Nonparanormal Skeptic." The Byar Award winner will receive a $1,500 cash award and Travel Award winners each will receive an $800 cash award. There were 62 applicants in this year's competition. We congratulate all of our awardees on their outstanding work and showing in the competition! 2012 Annual meeting of the International Biometrics Society / Eastern North American Region, as well as to their advisors, Ciprian Crainiceanu and Brian Caffo (Jeff), Kung-Yee Liang (Yang), and Constantine Frangakis and Mei-Cheng Wang (Taki). The winning papers were: "Corrected Confidence Bands for Functional Data Using Principal Components" (Jeff), "Bias Correction and Likelihood Based Inference under Model Misspecification" (Yang), and "Alternating Event Processes during Lifetimes: Population Dynamics and Statistical Inference" (Taki). Three Biostatistics faculty members have been named as first-term 2011-12 JHSPH Outstanding Teachers: Associate Professor Ciprian Crainiceanu for Advanced Methods in Biostatistics V, Assistant Scientist John McGready for Statistical Reasoning in Public Health I, and Assistant Professor Michael Rosenblum for Essentials of Probability and Statistical Inference I. Recognition of exceptional teaching is given for instructors who earn outstanding ratings for the categories of "Overall Course" and "Overall Instructor". Congratulations to Jeff Goldsmith (Advisor: Ciprian Crainiceanu; Co-Advisor: Brian Caffo) and Russell (Taki) Shinohara (Advisor: Constantine Frangakis; Co-Advisor: Mei-Cheng Wang), this year's co-recipients of the Margaret Merrell Award, established in 1995 by the friends, colleagues, and former students of the late faculty member Dr. Margaret Merrell (ScD, 1930). This award recognizes outstanding research by a Biostatistics doctoral student. Congratulations to faculty members Brian Caffo, Ciprian Crainiceanu, Han Liu, and John Muschelli and their students and postdoctoral fellows Ani Eloyan, Fang Han, Mary Beth Nebel and Tuo Zhao, who have been named the winners of the International Neuroimaging Data-sharing Initiative (INDI) ADHD-200 Global Competition. (View the official INDI announcement here). The competition "invited participants to develop diagnostic classification tools for ADHD diagnosis based on functional and structural magnetic resonance imaging (MRI) of the brain," and then apply them to diagnose ADHD presence and subtypes in test data. Twenty-one teams representing statistics, mathematics, and computer science competed. The Hopkins Biostatistics team was cited for the excellent specificity of its classifier. Congratulations to Shanshan Li, the recipient of this year's June B. Culley Award, which honors outstanding achievement by a Biostatistics student on his or her school-wide examination paper. Shanshan's paper was entitled "Optimal Nonlinear Combination of Multiple Markers and Bivariate ROC Analysis." Her advisor is Mei-Cheng Wang and co-advisor is Brian Caffo. Our very own Brian Caffo has been named the recipient of a Presidential Early-Career Award for Scientists and Engineers (PECASE). As noted in the White House press release of September 26, 2011, the PECASE is "the highest honor bestowed by the United States government on science and engineering professionals in the early stages of their independent research careers." Continuing from the press release, "Awardees are selected for their pursuit of innovative research at the frontiers of science and technology and their commitment to community service as demonstrated through scientific leadership, public education, or community outreach." Brian was a Department of Health and Human Services nominee and one of 94 to be named nationwide. We are incredibly proud of Brian, who does our department credit not only through his excellence but by the exceptional teacher, mentor, colleague and friend he is to all of us. View the press release. Looking for advice, potential sources of data, project ideas, literature review, and humor related to statistics and academia—or to join in the conversation on these? Check out a blog on these issues recently initiated by faculty members Rafael Irizarry, Roger Peng, and Jeff Leek: “Simply Statistics” - http://www.simplystatistics.tumblr.com. Thanks for the new forum! Five George Washington University graduates received Alumni Achievement Awards – the highest form of recognition given by the University and the GW Alumni Association to alumni on an annual basis – on September 15, 2011. Four alumni received the Distinguished Alumni Achievement Award, and one alumna, postdoctoral fellow Sherri Rose, received the Recent Alumni Achievement Award. The Recent Alumni Achievement Award is given to an alumnus/a within 10 years of graduation for notable achievements in their field with proven potential for future influence and leadership. Adjunct Professor Nilanjan Chatterjee was named as the recipient of the 2011 Presidents' and Snedecor Awards at a special recognition session held Wednesday, August 3 at the Joint Statistical Meetings in Miami, Florida. These awards are given by the Committee of Presidents of Statistical Societies (COPSS) and are among the most prestigious in the profession. The Presidents' Award recognizes outstanding contributions to the profession of statistics by a member of the statistical community generally 40 years or younger. The Snedecor award is given biannually in recognition of a noteworthy publication in biometry within three years of the date of the award. To receive both in the same year is an exceptional accomplishment. We are proud to count Nilanjan among our faculty and fortunate to benefit from his contributions to us. Nilanjan's Presidents' award citation recognized "outstanding contributions to the statistical sciences by ingenious methodological research for applications in epidemiology and genetics including studies of gene-environment interactions, disease heterogeneity and genome-wide association studies" as well as fundamental contributions to complex retrospective sampling designs and scientific leadership in studies of cancer epidemiology and genetics. His Snedecor award citation recognized Nilanjan's "groundbreaking work in statistical genetics, especially in developing powerful methods for gene-gene and gene-environment interactions in case-control genome-wide association studies" as well as his fundamental work in statistical methods for epidemiology. Both awards cited Nilanjan's exceptional mentorship and provision of leadership to the profession and to the National Cancer Institute. Biostatistics faculty members have been named as fourth-term 2010-11 JHSPH Outstanding Teachers: Professor Constantine Frangakis in Introduction to Statistical Theory II, Associate Professor Frank Curreiro in Spatial Analysis and GIS II, and Assistant Professor Jeff Leek in Advanced Methods in Biostatistics IV. Dr. Curreiro holds a primary appointment in Environmental Health Sciences in addition to his joint appointment in Biostatistics. Recognition of exceptional teaching is given for instructors who earn outstanding ratings for the categories of "Overall Course" and "Overall Instructor". Out of 159 courses evaluated during the 4th term, only 26 faculty were recognized for this accomplishment. View the article here. Congratulations to Associate Professor Roger Peng and his colleagues Francesca Dominici of the Harvard School of Public Health, Michelle Bell of Yale University, and Claudia Tebaldi of Climate Central, who have just been awarded an R21 grant from the National Institutes of Health for the project, "Extreme Heat and Human Health: Characterizing Vulnerability in a Changing Climate." Roger's project aims to quantify the effects of biological, environmental, and socio-economic factors that make individuals and populations more vulnerable to extreme heat through a national study of heat and older adults in the United States. We are proud of Roger's leadership in this emerging area. Jennifer Feder Bobb been selected to receive a Statistics in Epidemiology Young Investigator Award at the upcoming Joint Statistical Meetings in Miami, Florida. The award is based on her manuscript "A Bayesian Model Averaging Approach for Estimating the Relative Risk of Mortality Associated with Heat Waves in 105 U.S. cities, " written with mentors Roger Peng and Francesca Dominici. Jennifer will receive her award at the reception of the Statistics in Epidemiology Section of the American Statistical Association on Tuesday, August 2 from 5:30-7 PM in the Miami Beach Convention Center CC-C223. Our congratulations to Jennifer! Congratulations to Yifei Sun, who is the recipient of this year's Glaxo SmithKline Award, which honors outstanding performance by a PhD student on the Biostatistics first-year comprehensive exam. Congratulations also to Jiehuan Sun, who is the recipient of the Kocherlakota Award, which honors outstanding performance by a master's student on the Biostatistics first-year comprehensive exam. Associate Professor Ciprian Crainiceanu has been elected program chair of the American Statistical Association's Section on Nonparametric Statistics starting January 1, 2012. Congratulations, Ciprian! Congratulations to Assistant Scientist Gayane Yenokyan, Professor Marie Diener-West and their colleagues on the selection of their paper "Prospective Study of Obstructive Sleep Apnea and Incident Coronary Heart Disease and Heart Failure: The Sleep Heart Health Study" as the winner of the journal Circulation's "Best Paper Award" in the category of Population Science. Their work found obstructive sleep apnea to be associated with an increased risk of incident heart failure in community dwelling middle-aged and older men. It appeared in the July, 2010 issue; click here to view the full text of the article. Quoting from the award letter: "Circulation's Best Paper Award is determined by the editors, who consider the paper's importance in the field and evaluate usage statistics to identify those papers that have the greatest impact. All original articles published in Circulation from January, 2010 - present are eligible for the award, which is meant to recognize the contribution of our authors to the journal's excellence. The award is presented at the end of Circulation's symposium, 'Groundbreaking Studies in the Practice of Cardiovascular Medicine,' to be held at the American Heart Association's Scientific Sessions, on Sunday, November 13, 2011, in Orlando. We are proud of Gayane's and Marie's contributions to this important work. Congratulations to Associate Professor Roger Peng, student Jennifer Feder Bobb, and colleagues at the University of British Columbia, Yale, Harvard, and the National Center for Atmospheric Research on the dissemination of their work forecasting effects of climate change on the public's health. Their paper, "Toward a Quantitative Estimate of Future Heat Wave Mortality under Global Climate Change," used generalized additive Poisson regression models in the National Morbidity, Mortality, and Air Pollution Study database to project a considerable burden of excess deaths per year attributable to heat waves for the city of Chicago under a variety of climate change scenarios for 2081-2100 and global climate models. Published in the May issue of Environmental Health Perspectives, the work is being internationally publicized in the news media. An overview of this work was also featured in the Johns Hopkins Public Health Magazine. We are proud of Roger's and Jennifer's leadership in this important pursuit of statistics in science. Congratulations to Jeff Goldsmith, the recipient of a 2011 Teaching Assistant Recognition Award, given annually by the students of the Bloomberg School of Public Health. PhD candidates Simina Boca and Jennifer Feder Bobb tied for first place in the Department of Biostatistics section of the Delta Omega Poster Competition. Their winning posters were entitled "Making Gene-Set Analysis Interpretable and Practical" and "A Bayesian Model Averaging Approach for Estimating the Relative Risk of Mortality Associated with Heat Waves in 105 US Cities, " respectively. PhD candidate Paige Maas was awarded first prize in the Research on Aging Showcase Poster Competition held on April 15 for her poster "Statistical Approaches to the Analysis of Audiometric Data." The competition drew entries from students in a diversity of departments in the School of Public Health, as well as the Program in Gerontology at the University of Maryland. Congratulations to Paige and her mentors, Frank Lin, MD, and Ravi Varadhan, PhD, on work exemplifying the power of biostatistics to elucidate issues of import for public health and clinical medicine! The Departments of Biostatistics and Epidemiology are pleased to announce that the winning proposals for this year's Louis I. and Thomas D. Dublin Award are from Jennifer Feder Bobb from the Department of Biostatistics and from Andrew Jaffe from the Department of Epidemiology. While there were many strong applications, the award committee chose their proposals ("Statistical and Epidemiological Methods for Estimating the Adverse Health Effects Associated with Heat Waves under Global Climate Change and Identifying Susceptibilities," and "Environmental Insults, the Epigenome, and Development," respectively) as best exemplifying the award's goal of fostering research and education at the interface of biostatistics and epidemiology. Congratulations to Jennifer and Andrew! Congratulations to this year's student award winners Simina Boca (Margaret Merrell Award for Excellence in Research) and Jeff Goldsmith, Daniel Obeng, and Bruce Swihart (Helen Abbey Award for Excellence in Teaching). This year, the Abbey Awards are being designated in two categories: one for introductory courses for undergraduate and Public Health students, and one for Biostatistics core and elective courses. Drake LeBrun, a senior at Rice University, and a Department of Biostatistics / Center on Aging and Health participant in the School's 2010 Diversity Summer Internship Program, has been awarded a prestigious Thomas J. Watson Fellowship. The Watson Fellowship, as described on its home website, is a one year grant for independent study and travel outside the United States awarded to graduating college seniors of unusual promise. It aims to build capacity for resourcefulness, imagination, openness, and leadership and to foster their humane and effective participation in the world community. Drake's project, "Surgical Disparities in the Developing World: The Human Experience," will be carried out in Uganda, Bangladesh, Peru, and Trinidad and Tobago. Visit the Watson website for more information. Congratulations, Drake! We know you'll do great things. Congratulations to Ravi Varadhan, who has been awarded a 2011 Brookdale Leadership in Aging Fellowship. The fellowship recognizes early-stage research excellence and promise to achieve leadership on aging. One of the most prestigious career awards in gerontology, the fellowship supports 75% effort for awardees for two years. Approximately four national fellows are named each year. Ravi will pursue research to better delineate the applicability of intervention trial findings to populations not well-represented in trials, such as older adults. We're proud of your accomplishments, Ravi! Congratulations to Simina Boca (advisor: Giovanni Parmigiani; co-advisor: Jeff Leek) and Haley Hedlin (advisor: Brian Caffo) on successful PhD thesis defenses! Excellent teachers have been named for the second term. We've had four primarily appointed faculty named (among 24 total): Andre Hackman (Introduction to Data Management); Hongkai Ji (Advanced Statistical Computing); John McGready (Statistical Reasoning in Public Health II); and Daniel Scharfstein (Advanced Statistical Theory II). Additionally, Elizabeth Stuart was named for her Seminar on Statistical Methods for Mental Health. Research by Elizabeth Colantuoni and colleagues published recently in BMJ demonstrates the impact of a quality improvement initiative to eliminate catheter-related blood stream infections in ICU patients on hospital mortality. The paper is very important for the patient safety efforts spearheaded at Hopkins by co-authors Pronovost and Needham. Johns Hopkins has been listed #2 in the latest Science Watch ranking of High-Impact U.S. Institutions in Probability and Statistics 2005-09. The ranking is by number of citations per paper: At 5.29, Hopkins trailed only Stanford. The press release may be viewed at http://sciencewatch.com/dr/sci/11/jan2-11_2/. Congratulations to our faculty, students and staff for all you do to distinguish our department! Four Biostatistics faculty members have been named as first-term 2010-11 JHSPH Outstanding Teachers: Professors Karen Bandeen-Roche and Marie Diener-West in Statistical Methods in Public Health I; Professor Daniel Scharfstein in Advanced Statistical Theory I; and Assistant Scientist John McGready in Statistical Reasoning in Public Health I. Recognition of exceptional teaching is given for instructors who earn outstanding ratings for the categories of "Overall Course" and "Overall Instructor". Congratulations Karen, Marie, Dan, and John! The Biostatistics Mo-Team "Johns Hopkins Biostat" is in full swing in its drive to support Men's Health through the Movember Foundation. The Foundation holds a moustache growing event each November that raises funds and awareness for men's health. Check out our team here. All who wish may donate at that website. Cheer on your favorites! Congratulations and thanks, guys, for your efforts! Professor Daniel Scharfstein has been named as the 2010 recipient of the Distinguished Alum Award given annually by the Department of Biostatistics at the Harvard School of Public Health. Established in 2004, the award "recognizes an individual in government, industry or academia who has impacted the theory and practice of statistical science through research, methodology, organizational responsibility and teaching." Dr. Scharfstein will deliver an honorary lecture in conjunction with the award on February 10, 2011 at Harvard University. (View the associated press release here.) Congratulations, Dan! We're proud of your accomplishments and most grateful for all they -- and you -- do to impact science and enrich Johns Hopkins Biostatistics! Congratulations to Russell (Taki) Shinohara, the recipient of this year's June B. Culley Award, which honors outstanding achievement by a Biostatistics student on his or her school-wide examination paper. Taki's paper was entitled "Estimating Effects by Combining Instrumental Variables with Case-Control Designs." His advisor is Constantine Frangakis and co-advisor is Mei-Cheng Wang. It gives us tremendous pleasure to announce that Roger Peng has been promoted to Associate Professor. Roger has established himself as an internationally recognized expert in statistical methods for analyzing spatio temporal data, the study of air pollutant-associated health risks, and statistical computing, including computing solutions to enable reproducible research. He is also a leader in statistical computing education for the Department and in our very successful Training Program in Environmental Biostatistics, and he is an excellent mentor to masters’ and doctoral students. Finally he is a valued colleague who contributes to the School’s and Department’s success in many intangible ways. Hearing Roger’s accomplishments and standing in the field recounted in the Advisory Board meeting at which his promotion was just approved filled me with pride and delight. Roger’s work was consistently highlighted for its high quality and scientific impact; his communication of that work, as exceptionally articulate; and his scholarly reputation, as outstanding. Congratulations, Roger! Thank you for all you do to fuel our department’s excellence, spirit and impact. We are pleased to announce that Qingfeng Li, a PhD candidate in the Department of Population Family and Reproductive Health and a concurrent MHS candidate in the Department of Biostatistics, is the recipient of the inaugural Kocherlakota Award, which honors outstanding achievement by a Biostatistics master's degree student on the first-year comprehensive examination. The Kocherlakota Award is the analog of the Glaxo SmithKline Award honoring outstanding achievement on the first-year comprehensive examination for Biostatistics PhD students. We are extremely grateful to our alumna Dr. Kathleen Kocherlakota (ScM 1963, ScD 1969), who has established this award in memory of her husband and our alumnus, Dr. Subrahmaniam Kocherlakota (ScD 1964). Qingfeng will be presented with his award prior to the Biostatistics Seminar on December 8, 2010, with Dr. Kocherlakota in attendance. Congratulations, Qingfeng! Congratulations to Haochang Shou, who is the recipient of this year's Glaxo SmithKline Award, which honors outstanding performance on the Biostatistics first-year comprehensive exam. Haochang will be presented with her award at 3:45 on Wednesday, December 1, just prior to the seminar. We are most proud and pleased to announce that Drs. Marie Diener-West and John McGready have been named as the 2010 recipients of ASPH/Pfizer Excellence in Teaching Awards. Click here to view the news release announcing the story. Dr. Diener-West is the recipient of the Award for Teaching Excellence. As described on the ASPH website, the award “recognizes graduate public health faculty from full ASPH-member, accredited schools of public health who are notable for their teaching excellence. In particular, the award supports faculty who are outstanding in teaching and mentoring students toward distinction in public health research, teaching, and practice. The ASPH/Pfizer Award for Teaching Excellence aims to bring visibility to one outstanding faculty member and to reward the professor for excellence in teaching.” All who interact with Dr. Diener-West well know the exceptional dedication she shows to her students and skill she brings to teaching them. Thousands of students have benefited from her instruction and mentorship both at our School and around the world. She has pioneered new initiatives in distance education, short courses, teaching training for faculty and graduate assistants, and international education. She has received six Golden Apple teaching awards, the Ernest Lyman Stebbins Medal for Teaching Excellence from the Johns Hopkins Bloomberg School of Public Health, two Advising, Mentoring and Teaching Awards, and the Statistics Section Award for Academic Statistics from the American Public Health Association. She is a Fellow in the American Statistical Association, the Helen Abbey and Margaret Merrell Professor of Biostatistics Education at our School, and Chair of the Johns Hopkins Master of Public Health program. Dr. McGready is the recipient of the Early Career in Public Health Teaching Award. The ASPH website characterizes the award as recognizing “one full-time, graduate, public health faculty from a full ASPH-member, accredited school of public health who is early in his or her career and notable for teaching excellence. In particular, the ASPH/Pfizer Early Career in Public Health Teaching Award supports junior faculty who are outstanding in teaching and mentoring students toward distinction in public health research, teaching, and practice.” Dr. McGready is renowned for the energy, humor, dedication and skill he brings to his teaching. He consistently receives stellar instructor ratings from his students, earning recognition as an Outstanding Teacher virtually every term he instructs. He co-developed our pioneering online introductory sequence in biostatistics. He has already won three Golden Apple awards. This year, he received the inaugural American Statistical Association Section on Teaching Statistics in the Health Sciences Outstanding Teaching Award. Congratulations, Marie and John! We are grateful for the distinction you bring to our department in this vital aspect of our mission. As many of you know Johns Hopkins has a strong supportive relationship with the United Way and its local chapters. The School of Public Health is active in this relationship. Through the University's annual fundraising effort many important programs and services have been supported. We recently learned of a fun way we could help: On Friday September 10th United Way and NFL PLAY 60 have teamed up for a football season kickoff by encouraging fans to show their NFL team pride in celebration of the start of the season and to join their efforts to end childhood obesity. Join us in wearing your favorite NFL team's gear or colors on September 10! I extend a special invitation that we then show our support by gathering together at the SPH weekly Friday Happy Hour in the 2nd Floor student lounge at 4:30pm. For those who would like this is also an opportunity to donate to United Way. Click here for more information about doing so, what we'll do, and the event as a whole. Congratulations to Ben Langmead, Kasper Hansen, and Jeff Leek on their paper "Cloud-scale RNA-sequencing differential expression analysis with Myrna." As of August 25, 2010, the article has topped the frequency of last-month downloads for the journal Genome Biology at nearly 2800 after only two weeks of availability. The listing can be viewed here. The article describes and applies a new cloud-computing pipeline for efficiently calculating differential gene expression in large RNA-Seq datasets. SEPTEMBER 13 UPDATE: Ben's, Kasper's and Jeff's work has been featured in the JHU Gazette. Ben and Jeff are quoted in the article. Click here to view the article. Ben is a Research Associate, Kasper, a postdoctoral fellow, and Jeff, Assistant Professor in the Department. We are proud of the impact their work is having through its prolific dissemination in the academic community! Qing Li, Biostatistics professors Ingo Ruczinski and Tom Louis, and co-authors at the Johns Hopkins Medical Institutions have recently published a paper advancing discovery for gene-gene interactions in schizophrenia, "Detection of SNP-SNP interactions in trios of parents with schizophrenic children." In the paper Qing and her colleagues applied a novel method to detect multi-gene models for schizophrenia risk. The work was completed while Qing was a student in our department; it appeared in the July, 2010 issue of Genetic Epidemiology, the leading journal in that field. Qing completed her PhD in 2009 under Ingo's mentorship and is now appointed at the National Human Genome Research Institute, National Institutes of Health, Baltimore, Maryland. Congratulations to Qing, Ingo, Tom and their colleagues for their notable paper! Assistant Scientist John McGready has been named as the winner of the Outstanding Teaching Award presented by the American Statistical Association (ASA) Section on Teaching Statistics in the Health Sciences (TSHS). The ASA announcement of the award cited John for his extraordinary enthusiasm, dedication, and excellence in teaching biostatistics. In recognition of these qualities John repeatedly has been named for awards presented by the Johns Hopkins Bloomberg School of Public Health: multiple times as an "Outstanding Teacher," twice for the Excellence in Online Teaching Award, and three times for the Golden Apple Award -- the School's highest accolade for achievement in teaching in a given year, awarded annually by students in four categories. John's educational leadership has resulted in innovations to teaching programs and methods at our institution: He is the developer and co-instructor of Data Analysis Workshops I and II, offered in our School's Winter Institute and Summer Institute of Epidemiology and Biostatistics, and he co-developed and teaches the School's flagship online introductory sequence in biostatistics. John will be recognized for his award during the TSHS business meeting and mixer at the Joint Statistical Meetings, August, 2010, in Vancouver, British Columbia. Our enthusiastic congratulations to John on this high recognition! Karen Bandeen-Roche has been elected Chair of the Caucus of Academic Representatives for the American Statistical Association. The purpose of the Caucus is to promote the statistics discipline within the academic community and to provide resources for academic statisticians to successfully advocate for the discipline. Dr. Bandeen-Roche will serve as Chair-elect from Aug 2010-July 2011, Chair from Aug 2011-July 2012, and Past Chair from Aug 2012-July 2013. Recent graduates Sandy Eckel, Nick Reich, and Hong Zhu have been selected to receive Statistics in Epidemiology Young Investigator Awards at the upcoming Joint Statistical Meetings in Vancouver, Canada. The awards are based on their manuscripts "Modification by Frailty Status of Ambient Ozone and Particulate Matter Air Pollution Effects on Lung Function in Older Adults" (Sandy), "Estimating Case Fatality Ratios from Infectious Disease Surveillance Data" (Nick), and "Incorporating Sampling Bias in Analyzing Bivariate Survival Data with Interval Sampling and Application to HIV Research" (Hong). They will receive their awards at the reception of the Statistics in Epidemiology Section of the American Statistical Association on Tuesday, August 3 from 6PM-7:30PM in the Vancouver Convention Center CC-109 (west). Our congratulations to Sandy, Nick, and Hong! Congratulations to Hong Zhu (advisor: Mei-Cheng Wang) and Nick Reich (advisor: Ron Brookmeyer) on successful PhD thesis defenses! Ben Langmead, Research Associate in Biostatistics, has been named as a winner of the BioMed Central 4th Annual Research Awards for his paper Ultrafast and memory-efficient alignment of short DNA sequences to the human genome (Langmead B, Trapnell C, Pop M, Salzberg S, J Genome Biol 2009; 10:R75). The Awards recognize excellence in research disseminated through open access publication -- in the case of Ben's award, in the Journal of Genome Biology. The announcement can be viewed here. Congratulations to Ben and his colleagues! We are proud of Ben's achievement, and grateful for all he does to help us lead cutting-edge genomics research through the bridging of statistics and computer science. Congratulations to our departmental intramural soccer team, the Statistical Ninjas, who won their second league championship against a team from the School of Medicine. The final score was 11-3. Congratulations to Hao Wu (advisor: Rafael Irizarry; co-advisor: Hongkai Ji), Jessica Myers (advisor: Francesca Dominici), and Yong Chen (advisor: Kung-Yee Liang; co-advisor: Charles Rohde) on successful PhD thesis defenses! Congratulations to alumnus Paul Rathouz, who was recently selected to be the next chair of the Department of Biostatistics and Medical Informatics at the University of Wisconsin. Dr. Rathouz joined the faculty in the Department of Health Sciences, University of Chicago, following his 1997 receipt of his PhD from our department. In statistics, he has made notable contributions to likelihood methodology, longitudinal data analysis, and treatment of missing data. Collaboratively, he has advanced knowledge in areas including developmental psychology and behavioral genetics, sleep, and health econometrics. He is the Director of the Department of Health Studies PhD Degree program. He has emerged as a leader in our profession, serving regularly on NIH study sections and holding positions on editorial boards and leadership bodies of the statistical professional societies. Dr. Rathouz's dissertation research at Johns Hopkins was advised by Kung-Yee Liang. We're proud, Paul! We wish you all the very best. Drs. Elizabeth Stuart and Constantine Frangakis have been named as Outstanding Teaching Faculty in the Bloomberg School of Public Health for the course "Causal Inference in Medicine and Public Health" in the third term of the 2009-10 academic year. Recognition of exceptional teaching is given for instructors whose courses earn outstanding ratings from students. Only 24 out of 145 courses have been so honored in the term at issue. Congratulations to Liz and Constantine on this recognition of their dedication to education! Congratulations to three of our faculty who have been recognized for excellence in teaching and mentoring for 2009-10 by the Student Assembly of the Johns Hopkins Bloomberg School of Public Health. Professor Alvaro Munoz is the recipient of a Golden Apple Award. Assistant Professor Elizabeth Stuart and Professor Karen Bandeen-Roche are recipients, each, of both a Golden Apple Award and an Advising, Mentoring and Teaching Recognition Award (AMTRA). Professor Munoz is primarily appointed in Epidemiology and Professor Stuart is primarily appointed in Mental Health; each is a valued member of our jointly-appointed faculty. The Golden Apple Award recognizes excellence in teaching; five courses were so honored this year. The AMTRA recognizes outstanding educational contributions to the School; in a typical year approximately a dozen awards are given. Congratulations also to Dr. Gayane Yenokyan, who was nominated for a Staff Recognition Award for her efforts in helping students. Congratulations to Biostatistics faculty who have led or contributed notably in statistics, science and health research over the last two months: Professor James Tonascia, together with other researchers in the Nonalcoholic Steatohepatitis Clinical Research Network, contributed to a paper finding a benefit of Vitamin E for treating nonalcoholic steatohepatitis. The work appears in the New England Journal of Medicine (362(18):1675-85, 2010). Assistant Professor Hongkai Ji led in a paper reporting on the performance of hierarchical modeling methodology he has been developing for high-throughput experiments. He and co-author X. Shirley Liu found that the models provide reliable statistical estimates for data sets whose measurements vastly outnumber experimental samples. The work appeared in Nature Biotechnology (28(4):337-40, 2010). Associate Professors Brian Caffo and Ciprian Crainiceanu led in a paper reporting on their application of a two-stage singular value decomposition to obtain data driven population-level measures of functional connectivity in functional magnetic resonance imaging (fMRI). Their work appeared in Neuroimage (51(3):1140-9, 2010). Dr. Caffo also contributed to a paper led by recent Biostatistics MHS recipient, Dorry Segev, MD, finding no significant increase in long-term mortality among live kidney donors compared with a healthy matched cohort, as well as a stable surgical mortality rate in such donors over the last 15 years. Their work appears in the Journal of the American Medical Association (303(10):959-66, 2010). Finally, Professor Rafael Irizarry is now listed by Essential Science Indicators as the 2nd most frequently-cited mathematical scientist in the world, behind Terry Speed of Berkeley. Dr. Irizarry is also 18th highest on the computer science list. 2009-10 graduate Chi Wang has been inducated into the Alpha Chapter of the Delta Omega Public Health Honor Society. Risha Zuckerman was nominated by students for a Staff Recognition Award of the Student Assembly. The email of notification noted that the award "recognizes those staff members who are truly outstanding and go above and beyond to be of service to students" and congratulated Risha on the significant recognition of being nominated. Excerpts from the nominations included "Risha is an integral part of the biostatistics department.... Asking Risha for help always yields a quick and thorough response.... Risha literally keeps our department running. She is very dedicated, efficient and kind.... Her cheerful attitude and supportive personality make the biostatistics department a better place to be.” How true, Risha! Congratulations on this lovely recognition! Kung-Yee Liang has been named as the recipient of the APHA Rema Lapouse Award for 2010. This award, granted to an outstanding scientist in the field of psychiatric epidemiology, recognizes "significant contributions to the scientific understanding of the epidemiology and control of mental disorders." There will be a special session in Kung-Yee's honor at the APHA Annual Meeting in Denver, November 6-10, at which Kung-Yee will present the annual lecture associated with the award. Kung-Yee, in his typically thoughtful way, wishes to acknowledge the Department as well as four individuals whose help as he has pursued the topic area has been particularly important and meaningful to him: Chuck Rohde (Professor and former Chair of Biostatistics), Ann Pulver (Professor, Department of Psychiatry), Bill Eaton (Professor and Chair of Mental Health), and Gerry Nestadt (Professor, Department of Psychiatry). Assistant professor Jeff Leek has received an award from the Johns Hopkins Bloomberg School of Public Health's Faculty Innovation Fund. Jeff was awarded funding to support his development of statistical and computational methodology for the analysis of RNA sequencing data. Generally three to five awardees are named per year. We congratulate Jeff on this notable recognition of his work! Haley Hedlin and Russell Shinohara win first place for the Department of Biostatistics section of the Delta Omega Poster Competition. Haley won for her poster "Covariate-adjusted Nonparametric Analysis of Magnetic Resonance Images using Markov Chain Monte Carlo". Russell won for his poster "Estimating effect by combining instrumental variables with case-control designs." Congratulations to Haley, Russell, and their advisors, Brian Caffo (Haley) and Constantine Frangakis and Mei-Cheng Wang (Russell). Congratulations to Dublin Award winners Russell Shinohara and Isabel Rodriguez-Barraquer (Department of Epidemiology)! Congratulations to departmental student award winners Yong Chen, Jeff Goldsmith, Matthew McCall, Vidya Venugopal, and Hao Wu! Congratulations to Matthew McCall (advisor: Rafael Irizarry) on a successful PhD defense! Finbarr Leacy has just been named as the Gold Medal for University College Cork (Ireland) Science Graduate of the Year. This honor is awarded annually to the most outstanding graduate in the Faculty of Science. Finbarr, a first year Ph.D. candidate in Biostatistics, graduated from UCC last year; he was on hand on February 22 to be recognized for his award personally. You make us proud, Finbarr! Congratulations! Dr. John McGready has been named as an �€œexceptional teacher�€� in the Bloomberg School of Public Health for the course �€œStatistical Reasoning in Public Health II�€� in the second term of this 2009-10 academic year. Recognition of exceptional teaching is given for instructors who earn outstanding ratings for the categories of �€˜Overall Course�€™ and �€˜Overall Instructor.�€™ Only eleven out of 116 courses have been so honored in the term at issue. John has been named as an exceptional teacher multiple times previously, most recently in the first term of this year. Congratulations to John for his superb accomplishments in education! We are delighted to have had one of our own featured on National Public Radio: Professor Brian Caffo, in a January 25 interview on the "Midday" program on WYPR in Baltimore. Brian was interviewed for his work on sleep health and quality, together with his colleagues Dr. Naresh Punjabi (Departments of Medicine and Epidemiology) and Dr. Adam Spira (Department of Mental Health). You can check out the program at the following link: http://www.publicbroadcasting.net/wypr/Midday.mediaplayer?STATION_NAME=wypr&MEDIA_ID=881966&MEDIA_EXTENSION=mp3&MODULE=Midday As always, thank you, Brian, for proving that Biostatistics is exciting, important and fun! Jessie Myers has won an ASA Health Policy and Statistics Section Student Paper Award for work to be presented at the 2010 Joint Statistical Meetings. Jessie's winning paper is entitled, "Regression Adjustment and Stratifcation by Propensity Score in Treatment Effect Estimation." The work was advised by Tom Louis. Congratulations to Jessie and Tom, most especially as this is Jessie's second year in a row of being recognized with the award! Congratulations to Haley Hedlin and Hong Zhu, who have been recognized with Student Travel Awards for papers to be presented at the 2010 Annual meeting of the International Biometrics Society / Eastern North American Region, as well as to their advisors, Brian Caffo (Haley) and Mei-Cheng Wang (Hong). Haley won for her paper " Covariate-adjusted Nonparametric Analysis of Magnetic Resonance Images using Markov Chain Monte Carlo," and Hong won for her paper "Learning Incorporating sampling bias in analyzing bivariate survival data with interval sampling and application to HIV research." We are proud of you, Haley and Hong! Professors Andrew Feinberg and Rafael Irizarry have published data in support of a novel theory for the role of epigenetic changes in evolution. Their work appears in the December 14 early online edition of the Proceedings of the National Academy of Sciences and has been widely reported in the science media. It suggests that genetic variants may contribute to phenotypic variability, and not only mean changes, thereby providing “a mechanism for developmental plasticity and evolutionary adaptation to a fluctuating environment” (from the article). The Hopkins news release may be found at the link http://www.hopkinsmedicine.org/Press_releases/2009/12_15_09.html. Congratulations to Rafael for his work and for so fascinatingly demonstrating the power of statistics in science! The Fall 2009 Issue of Johns Hopkins Public Health magazine features an article highlighting the leadership of Drs. John McGready and Marie Diener-West in the School’s distance education initiatives. John and Marie have been at the leading edge of these efforts since their inception—John, as an “Internet pioneer… for the past 10 years” (quote from the article), and Marie, in her Department-leading role as the Helen Abbey and Margaret Merrell Professor in Biostatistical Education and, now, the Chair of the School’s Master of Public Health Program. The article strikingly highlights how central John and Marie, and through them, our department, has been in this critically important frontier for education in the current day, of which we are duly proud! The article may be found at http://magazine.jhsph.edu/2009/fall/features/global_classroom/page_1/. The Fall 2009 Issue of Johns Hopkins Public Health magazine features an article highlighting the research of Professors Brian Caffo and Ciprian Crainiceanu together with their colleague, Dr. Naresh Punjabi, on the ramifications of sleep for health . The article follows on Naresh’s and Brian’s highly publicized PLoS Medicine article of last August finding those with disordered sleep at risk for increased mortality but also provides a lovely summary of Brian’s and Ciprian’s broader, central role in making sense of the vast data sets that arise in characterizing sleep and its outcomes. The article may be found at http://magazine.jhsph.edu/2009/fall/features/counting_sleep/page_1/. Congratulations to Brian and Ciprian for compellingly illustrating the power of biostatistics in advancing science on health. The Biostatistics indoor intramural soccer team, the Statistical Ninjas, won the final championship game for the league this evening. We were down 1-6 at the half and then rallied to win 7-6! 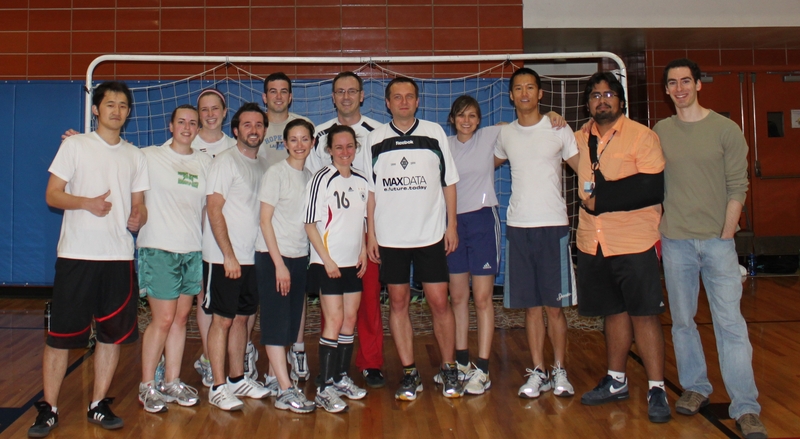 Check out a photo that John Muschelli took after the game of the winning team, minus Ingo and Carlo. Congratulations Statistical Ninjas! All who wish may donate there. Cheer on your favorites! Congratulations and thanks, guys, for your efforts! View the newest Mo-Team "Rotzbremse" group photo here! Congratulations to our faculty who were prominently recognized at the 2009 meeting of the American Public Health Association (APHA), Ron Brookmeyer and Rafael Irizarry. Ron has been named to deliver the Lowell Reed Lecture, an address given each year at the annual APHA meeting by an individual who has contributed to the field of statistics and public health statistics through his/her contributions in research, teaching and service. His lecture was entitled "Measuring the HIV/AIDS Epidemic: Challenges and Opportunities." Rafael was presented with the 2009 Mortimer Spiegelman Award, which recognizes a statistician age 40 years or younger who has made outstanding contributions to public health statistics. Ron's lecture and Rafael's award presentation both occurred in the Spiegelman and Statistics Section Awards Session. The Lowell Reed Lecture commemorates the life and career of Dr. Lowell Reed, a Hopkins giant who became Chair of our Biostatistics department in 1926, served as the Dean of the School of Public Health from 1937 to 1946, and was University President from 1953 to 1956. The Spiegelman and Statistics Section Awards Session was held on Tuesday Nov 10 at 2:30 at the Philadelphia Marriott Downtown. Read the 2009 Annual Department letter here! Congratulations to Debra Moffitt, whose painting, “Skipjack Dawn” took First Prize honors in the Marine Painting category at the recently held Havre de Grace Plein Air Painting Competition. More information about the show can be found at http://www.hdgpleinair.com/. 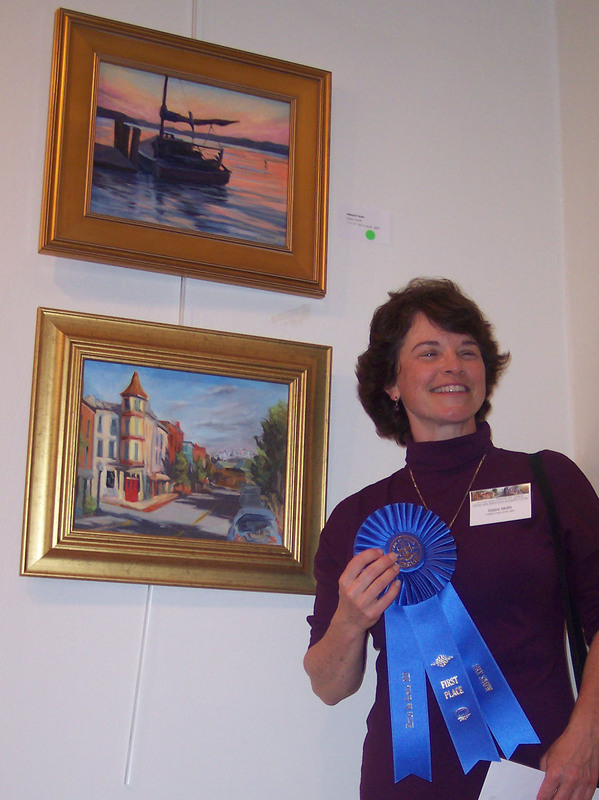 Debra can be seen here with her award-winning painting as well as a second entry. All paintings will be on display through October 31; a portion of all sales will go to benefit the charity Soroptimist International. Congratulations to Haley Hedlin and Bruce Swihart, co-recipients of this year's June B. Culley Award, which honors outstanding achievement by a Biostatistics student on their school-wide examination paper. Congratulations as well to Haley and Bruce's advisor, Brian Caffo. Congratulations to Brian Caffo who, together with primary author Naresh Punjabi and colleagues on the Sleep Heart Health Study, has published a highly visible article, “Sleep-Disordered Breathing and Mortality: A Prospective Cohort Study,” in the August 18 issue of PLoS Medicine. The paper’s findings are being widely publicized in the international press. It reports an association between sleep disordered breathing and mortality, rising to an estimated two-fold increase in death hazard for those with severely disordered breathing as compared to those without disordered breathing among middle- to older-aged men. Professor Rafael Irizarry has been named on the ScienceWatch list of Most Cited Institutions from 1999–2009. According to ScienceWatch, the listing, published this month, names scholarly institutions which “attracted the highest total citations to their papers published in Thomson Reuters indexed journals” over the period of January 1, 1999-April 30, 2009. Johns Hopkins rated third; Professor Irizarry was named as one of nine particularly prolifically cited Hopkins faculty, for statistical work that has substantially improved the output of gene chip technology. The full report can be found at http://sciencewatch.com/inter/ins/09/09Top20Overall/. Congratulations to Rafael! Professor Rafael Irizarry has been named as the 2009 Presidents' Award winner by the Committee of Presidents of Statistical Societies (COPSS). As COPSS documents describe, The Presidents' Award is "given annually to a young member of the statistical community in recognition of outstanding contributions to the profession of statistics." It is arguably the profession's most prestigious award honoring early career contributions, offered jointly by the five major statistical societies comprising COPSS: the American Statistical Association, Eastern North American Region of the International Biometric Society, the Institute of Mathematical Statistics, the Statistical Society of Canada, and the Eastern North American Region of the International Biometric Society. The award recognized Professor Irizarry for contributions of which we are well aware: his leadership and world-class contributions in science both biological and statistical, his teaching and mentoring, and his development and promulgation of practice-transforming software. We are enormously proud of him. I invite you to celebrate his accomplishments with him and us. Our proud congratulations to Professors Rafael Irizarry and Dan Scharfstein, who were presented as Fellows of the American Statistical Association on Tuesday evening, August 4. Professor Irizarry’s citation named his signature leadership in methods development and implementation for the analysis of gene expression and other genomic data as well as his leadership in creating and administering Bioconductor and thereby promulgating the culture of reproducible research. Professor Scharfstein’s citation named his major contributions to statistical methodology, particularly for group sequential studies, coarsened data, and causal inference as well as his excellence in advising, teaching, mentoring of graduate students and graduate program administration. The presentation was made at the ASA Awards Session at the 2009 Joint Statistical Meetings in Washington, DC. Congratulations to students Hong Zhu and Yu-Jen Cheng, who have been recognized with Student Travel Awards for papers to be presented at the 2009 Annual meeting of the American Statistical Association's Section on Statistics in Epidemiology, as well as to their advisors, Mei-Cheng Wang (Hong and Yu-Jen) and Ciprian Crainiceanu (Yu-Jen). Hong won for her paper "Analyzing Bivariate Survival Data with Interval Sampling and Application to Cancer Epidemiology" and Yu-Jen for his paper, "Marginal Causal Estimation for the Proportional Hazard Model with Prevalent Sampling." Shanshan Li is this year's recipient of the Glaxo SmithKline Award, sponsored by GSK to encourage interest in the field of Biostatistics and honoring outstanding achievement on the Department of Biostatistics first-year exam. Professor Rafael Irizarry has been named as the recipient of the 2009 Mortimer Spiegelman Award. This honor, awarded annually by the American Public Health Association, recognizes a statistician age 40 years or younger who has made outstanding contributions to public health statistics. The award committee was “enormously impressed with the quality, content, and impact of [Rafael’s] work”. We, too, are enormously impressed, and proud. Rafael has our warm congratulations! Hong Zhu has been selected as the recipient of 2009 International Chinese Statistical Association (ICSA) Applied Statistics Symposium Jian-Ping Hsu Memorial Scholarship, and a Student Paper Award, for the paper "Analyzing bivariate survival data with interval sampling and application to cancer epidemiology." The paper has also been selected for a 2009 Boyd Harshbarger Southern Regional Council on Statistics (SRCOS) Graduate Student and Junior Faculty Travel Award. Hong will present her paper in June in an Invited Session in honor of Dr. Hsu at the ICSA 2009 Applied Statistics Symposium, San Francisco, CA, as well as at the SRCOS 2009 Summer Research Conference, Jekyll Island, GA. Our enthusiastic congratulations to Hong and to her advisor, Dr. Mei-Cheng Wang. Sonja Greven has been named as the winner of the 2009 David P. Byar Young Investigator Award presented annually by the Biometrics Section of the American Statistical Association. The award is given to an investigator who has held a doctorate in statistics, biostatistics or related field for three years or less for best emerging work to be presented at the JSM. Dr. Greven is a post-doctoral fellow in the Department. Her winning paper, co-authored with Thomas Kneib, is entitled "On the Behavior of Marginal and Conditional Akaike Information Criteria in Linear Mixed Models." Our warm congratulations! Professors Rafael Irizarry and Dan Scharfstein have been named to the 2009 “class” of Fellows of the American Statistical Association. Professor Irizarry’s citation named his signature leadership in methods development and implementation for the analysis of gene expression and other genomic data as well as his leadership in creating and administering Bioconductor and thereby promulgating the culture of reproducible research. Professor Scharfstein’s citation named his major contributions to statistical methodology, particularly for group sequential studies, coarsened data, and causal inference as well as his excellence in advising, teaching, mentoring of graduate students and graduate program administration. Our proud congratulations to both of these superb faculty members! Congratuations to Gary Chan who was selected as a 2009 inductee for the Alpha Chapter of Delta Omega, the Public Health Honor Society of the Johns Hopkins Bloomberg School of Public Health. Marie Diener-West has been awarded the 2009 Golden Apple for excellence in teaching, large class size, by the Student Assembly Honors and Awards Committee. Only four Golden Apples are given out per year: this is Marie's sixth receipt of the award. We applaud Marie for her commitment to education and celebrate here recognition! Congratulations to Francesca Dominici on her 2009 Diversity Recognition Award from the JHU Diversity Leadership Council. These awards recognize exceptional contributions of faculty, staff and students in advancing and celebrating diversity and inclusiveness at Johns Hopkins. We applaud Francesca for her commitment to creating a gender neutral environment in academia. Congratulations to this year's winners of the Louis I. and Thomas D. Dublin Award: Sandrah Eckel and Maria Tellez-Plaza (Department of Epidemiology). Congratulations to Qing Li, who successfully defended her PhD thesis (Genetic Association Tests: Trio Logic Regression and Score Test) on March 12. Congratulations also to her advisor, Ingo Ruczinski. Congratulations to this year's departmental student award winners: Nick Reich (Helen Abbey Award); and Chongzhi Di (Margaret Merrell Award). Hong Zhu has been named the winner of the Biostatistics subset of the 2009 Delta Omega poster competition for her project: Understanding Progression of Ovarian Cancer in the US from SEER Data: A Semiparametric Joint Model for Bivariate Survival Distribution with Interval Sampling. We understand that there was large participation this year, making for a very close competition. Our congratulations to all who participated, and our special congratulations to Hong on her winning entry! Congratulations to Yu-Jen Cheng, who successfully defended his PhD thesis (Statistical Methods for Failure Time Data with Biased Sampling and Measurement Errors) on March 3. Congratulations also to his advisors, Mei-Cheng Wang and Ciprian Crainiceanu. Congratulations to Rob Scharpf, who has just been awarded funding for his K99/R00 submission entitled "Statistical methods for assessing copy number variation from SNP arrays". The K99/R00 award is a new mechanism to provide up to five years of support: one - two years of mentored support and three subsequent years of independent support. Rob's project proposes to develop novel statistical approaches to improve locus-level estimation of DNA copy number, inference of copy number variant regions, and the association of copy number variants with phenotypes. Congratulations to Ciprian Crainiceanu, who has been promoted to Associate Professor. We are proud to be his colleagues! Professor Rafael Irizarry will deliver the January 28 seminar in the 2008-2009 Dean's Lecture Series. His title is "The Role of Statistics in the Genomic Revolution: Rescuing Signal from a Sea of Noise." The lecture is scheduled for 4-5 PM in Sheldon Hall, W1214, and a reception with follow immediately thereafter. Our congratulations ot Rafael! New NCI initiative on joint training program announced. Congratulations to Sandy Eckel and Jessie Myers, who have won ASA Health Policy and Statistics Section Student Paper Awards for work to be presented at the 2009 Joint Statistical Meetings! Congratulations as well to their advisors, Tom Louis (Sandy) and Francesca Dominici (Jessie). Sandy and Jessie were two of five winners in the competition. Congratulations to Professor Rafael Irizarry and his colleagues, whose 2007 Biostatistics "Exploration, normalization, and genotype calls of high-density oligonucleotide SNP array sdata" has been named a "fast breaking paper" in Mathematics by Essential Science Indicators. The recognition identifies the paper as one of the most-cited in its discipline published during the past two years. Congratulations to Rafael Irizarry and his colleagues, including Biostatistics Ph.D student Hao Wu, who will have a pair of papers to appear in Nature Genetics. The papers are entitled "The human colon cancer methylome shows similar hypo- and hypermethylation at conserved tissue-specific CpG island shores" and "Large histone H3 lysine 9 dimethylated chromatin blocks distinguish differentiatied from embryonic stem cells." Rafael is the lead author on the first; Hao is the co-lead author on the second, which will appear on the February cover. ... to Constantine Frangakis, who has been promoted to Professor with Tenure. We are proud to be his colleagues. ... to Ciprian Crainiceanu, who has been awarded an NIH R01 grant as Principal Investigator, "Statistical Methods for Multilevel Multivariate Functional Studies." Ciprian's JHU colleagues Brian Caffo and Naresh Punjabi are collaborators, as well as David Ruppert from Cornell. The proposed research framework will lead to automatic, data based, methods for studying how medical disorders may disturb sleep and whether sleep disruption is related to health consequences. ...to Howard Chang, Jessie Myers, and Yu-Jen Cheng, who have recognized with Student Travel Awards for papers to be presented at the 2009 Annual meeting of the International Biometrics Society / Eastern North American Region, as well as to their advisors, Roger Peng (Howard), Francesca Dominici (both Howard and Jessie), and Ciprian Crainiceanu (Yu-Jen). Howard won for his paper "Bayesian Model Averaging For Clustered Data:Imputing Missing Air Pollution Data"; Jessie, for her paper "Learning from Near Misses in Medication Error Reports: A Bayesian Approach"; and Yu-Jen, for his paper, "Cox Models with Smooth Functional Effect of Covariates Measured with Error." We are delighted to announce that Dr. Karen Bandeen-Roche has been appointed as the Frank Hurley and Cathernie Dorrier Professor and Chair of the Department. Dean Klag, in his announcement, expressed that "she cares deeply about the Department and is the perfect person to lead what is one of the finest biostatistics departments in the world." Congratulations Karen! Drs. John McGready and Dan Scharfstein were named in a December 1 press release as two of six “exceptional teachers” in the School of Public Health for the first term of the 2008-09 academic year. As stated by the release, recognition of excellent teaching requires “a rating of excellent by at least 75 percent of the students in the categories of ‘Overall Course’ and ‘Overall Instructor.’” Congratulations to John and Dan! Congratulations to Kenny Shum, who successfully defended his PhD thesis on November 18. Congratulations to Professors Aravinda Chakravarti, Dani Fallin, Rafael Irizarry, Fernando Pineda, and Sarah Wheelan, who led in projects recently announced for funding under the University’s Discovery Initiative of its Framework for the Future Process. Drs. Irizarry and Wheelan were among key personnel for the proposal “Nucleating a Discipline: Creating Leadership in Bioinformatics and Computational Biology.” Dr. Irizarry was among key personnel in a second winning proposal together with Drs. Chakravarti, Fallin, and others: “Johns Hopkins Individualized Medicine Program.” Dr. Pineda was among key personnel for the proposal “Initiative in Computational Learning.” We celebrate your achievement. Congratulations to Yen-Yi Ho, who successfully defended her PhD thesis on October 27. Congratulations to our part-time faculty member Simon Day, who has been named a joint editor of the Journal of the Royal Statistical Society, Series A ("Statistics in Society")! Professor Rafael Irizarry is currently listed as the world's fourth most cited researcher in the general field of mathematics on the ISI Web of Knowledge. Dr. Irizarry's listing has been recognized in the current Johns Hopkins University Provost report to the University Leadership. Congratulations, Rafael! Congratulations to Giovanni Parmigiani and his colleagues at the Johns Hopkins Kimmel Cancer Center who, together with their co-authors, have published a pair of papers in the September 4 issue of Science Express. The papers are entitled "An Integrated Genomic Analysis of Human Glioblastoma Multiforme" and "Core Signaling Pathways in Human Pancreatic Cancers Revealed by Global Genomic Analyses." The former seeks to identify genetic alterations in the most common and lethal form of brain cancer, and the latter, to advance understanding of the pathogenesis of pancreatic cancer. Welcome to our incoming class for the 2008-2009 academic year: JohnBaptist Bwanika, Nathan James, Jenna Krall, Deborah Kuk, Shanshan Li, John Muschelli, Kristen Nelson, Hilary Parker, Vivienne Thairu, Vidya Venugopal, and Rachel Whitaker. Congratulations to Gary Chan and Benilton Carvalho, who successfully defended their PhD theses on August 19 and 21, respectively. Congratulations to Scott Zeger, who was awarded the Wilks Memorial Award from the American Statistical Association on August 5. This award recognizes contributions (either recent or past) to the advancement of scientific or technical knowledge, ingenious application of existing knowledge, or successful activity in the fostering of cooperative scientific efforts that have been directly involved in matters of national defense or public interest. Congratulations to Marco Carone, this year's recipient of the June B. Culley Award, which honors outstanding achievement by a Biostatistics student on the second-year paper! Congratulations to Professor Mei-Cheng Wang and her colleagues on their grant, "Statistical Methods for HIV/AIDS Research," recently awarded by the NIAID for a four-year period. Professor Wang's co-investigators include two other of our faculty, Drs. Constantine Frangakis and Daniel Scharfstein, and two external colleagues, Drs. Ying Qing Chen (Fred Hutchinson Clinical Research Center) and Yijian Huang (Emory). The research to be conducted will develop new statistical models and methods to better address challenges for the interpretation of survival, recurrent events and marker process data arising in HIV/AIDS clinical trials and cohort studies and thus improve the accuracy and precision of resulting findings. Congratulations to Professor Rafael Irizarry and his colleagues, whose 2003 Biostatistics paper "Exploration, normalization, and summaries of high density oligonucleotide array probe level data" has been named a "current classic" by Essential Science Indicators. Current Classics is a listing of papers per field having the greatest absolute increase in cumulative citations from the previous bimonthly period to the current period. Professor Irizarry's paper was the Current Classic in Mathematics for the period October, 2007-December 2007. Congratulations to Hopkins Biostatistics faculty and students Roger Peng, Howard Chang, Aidan McDermott, Scott Zeger and Francesca Dominici and their colleagues Michelle Bell (Yale University) and Jon Samet (Johns Hopkins Epidemiology) for their article in the May 14 issue of the Journal of the American Medical Association investigating the health effects of course particulate air pollution. Departmental faculty and staff receiving special recognition for teaching from the School of Public Health are: John McGready and Brian Caffo (Golden Apple Award); Ciprian Crainiceanu (Advising, Mentoring, and Teaching Recognition Award); Brian Whitcomb (Teaching Assistant Recognition Award); and Patty Hubbard (Staff Recognition Award). Congratulations to this year's departmental student award winners: Sandy Eckel (Helen Abbey Award); Marco Carone, Bryan James, and Bruce Swihart (Louis I. and Thomas D. Dublin Award); Wenyi Wang (Jane and Steve Dykacz Award); Gary Chan and Yue Yin (Margaret Merrell Award). Gary Chan, Chongzhi Di, and Chi Wang are recipients of ENAR Distinguished Student Paper Awards. Simina Boca is this year's recipient of the Glaxo SmithKline Award, sponsored by GSK to encourage interest in the field of Biostatistics and honoring outstanding achievement on the Department of Biostatistics first-year exam. Jointly-appointed assistant professor Frank Curriero's paper "On the use of non-Euclidean distance measures in geostatistics" has just been chosen by the International Association for Mathematical Geology as the best paper in their journal Mathematical Geology for 2006. Congratulations to Professor Giovanni Parmigiani and PhD student Simina Boca for their contributions to the Science paper "The genomic landscapes of human breast and colorectal cancers," by the Vogelstein team. Professor Ron Brookmeyer has been elected to membership in the National Academy of Sciences' Institute of Medicine. It is one of the highest honors for those in the biomedical profession. Assistant Professor Roger Peng is the winner of this year's chili cook-off. Click here to view a photo of all of our cook-off competitors and supporters with Roger, who is sporting his trophy sombrero. In a recent issue of Alzheimer's & Dementia, professor Ron Brookmeyer and colleagues estimate that Alzheimer's disease cases will quadruple worldwide by 2050. Read the Johns Hopkins Bloomberg School of Public Health Press Release. Assistant professor Hongkai Ji has received an award from the Johns Hopkins Bloomberg School of Public Health's Richard L. Gelb Cancer Research Fund. Dr. Ji was recognized for his work on decoding transcriptional regulatory programs in tumors dependent on hedgehog signaling. Professor Francesca Dominici is this year's Myrto Lefkopoulou Distinguished Lecturer at Harvard University's Department of Biostatistics. Previous Hopkins faculty members who have been so honored are Steve Goodman, Ron Brookmeyer, and Giovanni Parmigiani. Associate Professor Rafael Irizarry is the recipient of the American Statistical Association's 2007 W.J. Youden Award in Interlaboratory Testing. Dr. Irizarry's recent paper on multiple-laboratory comparison of microarray platforms was recognized for its outstanding contributions to the design and/or analysis of interlaboratory tests. PhD candidate Sheng Luo (advisor: Ciprian Crainiceanu) is the recipient of a Young Investigator Award from the American Statistical Association's Section on Statistics in Epidemiology (SIE). This award recognizes the best paper presented by a "Young Investigator" at a session of the 2007 Joint Statistical Meetings sponsored by the SIE. PhD candidate Bruce Swihart has won second prize in the Mason F. Lord Lecture Poster Competition for his poster "Compression of Multi-State Morbidity." The competition drew entries from faculty, postdoctoral fellows and students in a diversity of program, including the Departments of Biostatistics, Epidemiology, Mental Health, and Population, Family and Reproductive Health in the School of Public Health, as well as the Division of Geriatrics and Gerontology in the School of Medicine. Congratulations to Bruce on work that exemplified the power of biostatistics to elucidate issues of import for public health and clinical medicine! Professor Marie Diener-West has been chosen as the 2007 recipient of the Ernest Lyman Stebbins Medal. The award is given for outstanding teaching that crosses multiple school departments. Departmental faculty and students receiving special recognition for teaching from the School of Public Health are: Ingo Ruczinski (Advising, Mentoring, and Teaching Recognition Award) and Ming An (Teaching Assistant Recognition Award). Congratulations to this year's departmental student award winners: Ming An and Robert Scharpf for the Helen Abbey Award for Excellence in Teaching; Robert Scharpf for the Margaret Merrell Award for Excellence in Research; and Susan Hutfless (Epidemiology) and Sheng Luo (Biostatistics) for the Louis I. and Thomas D. Dublin Award for the Advancement of Epidemiology and Biostatistics. Sheng has also received the following additional honors for his research on the stochastic nature of tobacco addiction behavior: the ENAR Distinguished Student Paper Award, the IMS Laha Travel Award, and Delta Omega Alpha Chapter's Scientific Poster Competition overall winner. Professor Francesca Dominici is the recipient of the 2007 Gertrude M. Cox Award. Established in 2003 through a joint agreement of RTI International and the Washington Statistical Society (the Washington, DC, chapter of the American Statistical Association), this award is given annually to recognize a statistician making significant contributions to statistical practice. Professor and Chair Scott Zeger has been awarded the 2007 Marvin Zelen Leadership Award in Statistical Science from Harvard University's Department of Biostatistics. This annual award was established to honor Dr. Marvin Zelen's long and distinguished career as a statistician and his major role in shaping the field of biostatistics and recognizes an individual in government, industry, or academia, who by virtue of his/her outstanding leadership, has greatly impacted the theory and practice of statistical science. Professor and Chair Scott Zeger has been awarded the Royal Statistical Society's 2007 Bradford Hill Medal, which is awarded every three years to a Fellow of the Society for outstanding or influential contributions to the development, application, or exposition of medical statistics. Visiting assistant professor Derek Cummings is the recipient of a Career Award at the Scientific Interface, given by the Burroughs Wellcome Fund to support physical and computational scientists entering biology. PhD candidate Sheng Luo has received an International Biometric Society Eastern North American Region (ENAR) Distinguished Student Paper Award for the 2007 ENAR Spring Meeting in Atlanta. Scott Zeger has been elected to membership in the National Academy of Sciences' Institute of Medicine. Election to this prestigious body affirms his remarkable contributions to medical science, health care and public health. It is one of the highest honors for those in the biomedical profession. See details. Congratulations to Sining Chen, assistant professor of EHS and Biostatistics, Giovanni Parmigiani, Professor of Oncology and Biostatistics, Wenyi Wang, Biostatistics PhD student, and their collaborators for their paper on MMPro, a statistical model that predicts colon cancer among at risk patients. The paper appears in the September 27, 2006, issue of the Journal of the American Medical Association (JAMA). View faculty member Tom Louis's Presidential Address from the International Biometric Society's XXIIIrd International Biometric Conference. PhD candidate Rob Scharpf is the recipient of a BioC 2006 Student Contributor Award, co-sponsored by the American Statistical Association's Section on Statistical Computing and the Bionconductor Foundation of North America. Faculty member Karen Bandeen-Roche has been named chairperson of NIH's Biostatistical Methods and Research Design Study Section, Center for Scientific Review, for the term July 1, 2006 through June 30, 2008. Faculty member Francesca Dominici is the recipient of the 2006 Mortimer Spiegelman Award, given each year by the Statistics Section of the American Public Health Association in recognition of outstanding contributions to public health statistics by a statistician under the age of 40. Postdoctoral fellow Holly Janes has received a Young Investigator Award from the American Statistical Association's Statistics in Epidemiology Section. PhD candidate Yun Lu has received a travel award to the 2006 Joint Statistical Meetings from the American Statistical Association's Statistics in Epidemiology Section. Faculty member Marie Diener-West has been elected a Fellow of the American Statistical Association. Departmental faculty receiving special recognition for teaching are: Scott Zeger (Golden Apple Award) and Brian Caffo (Advising, Mentoring, and Teaching Recognition Award). Congratulations to this year's departmental student award winners: Kenny Shum for the Helen Abbey Award; Brian Egleston for the Jane and Steve Dykacz Award; Hormuzd Katkifor the Margaret Merrell Award; and Kelly Benke and Yun Lu/J.Morel Symons for the Louis I. and Thomas D. Dublin Award. Recent work by Francesca Dominici, Roger Peng, Michelle Bell, Luu Pham, Aidan McDermott, Scott Zeger, and Jonathan Samet on associations between short-term exposure to fine particulate matter and hospitalization was featured as the lead article in the March 8 issue of the Journal of the American Medical Association. View the Bloomberg School of Public Health press release. Recent work on trauma-center care by Biostatistics alumna Ellen MacKenzie, faculty member Daniel Scharfstein, PhD candidate Brian Egleston, and colleagues was featured in the January 26 issue of the New England Journal of Medicine. View the Bloomberg School of Public Health press release. Congratulations to assistant professor Ciprian Crainiceanu, who is the 2006 recipient of the American Statistical Association's Noether Young Scholar Award, which honors research and teaching in nonparametric statistics.